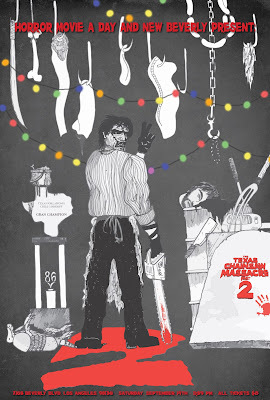 Horror Movie A Day: HMAD Screening: Texas Chainsaw Massacre 2! No, you haven't gone back in time. HMAD hosted a showing of Tobe Hooper's delightfully nutty 1986 sequel a few years back, but it was during Comic Con and thus a lot of people missed out. So on Saturday, September 14th at 11:59pm, we're bringing it back! Time has been kind to TCM2; not only did the following sequels pale even further from the original (though I quite like Leatherface, and have asked to host a showing of that several times - New Line unfortunately no longer has 35mm prints of it), but it proved to be the last real big-screen effort from Tobe Hooper; a few of his films have had limited releases since (most notably The Mangler), but it's mostly been DTV junk and television work ever since. And this year's TCM3D, if nothing else, proved that Leatherface is only as interesting as the people around him, so why not revisit/re-love Bill Moseley's legendary turn as Chop-Top, and the late Jim Siedow's expanded role as the family patriarch? Also, last time I didn't even put together a poster! Does it even count as an HMAD screening if there isn't a poster to go along with it? HMAD fan Jacopo Tenani (website HERE) has once again delivered an awesome custom poster for the event, playing up the movie's more comedic tone (and paying tribute to the incredible set design - note the Christmas lights), while sticking to tradition of putting my head in there somewhere. Send him some love if you enjoy his work - he does all of these out of the kindness of his heart (and, I assume, to spare his fellow HMAD fans another awful Photoshop job by me), and he did this one quickly despite putting together a gallery right now! Very cool. As always, the screening will be at the New Beverly Cinema in Los Angeles, located at 7165 Beverly Blvd. Tickets are 8 bucks cash or card at the door, or in advance at BrownPaperTickets.com. Street parking is widely available, and while we don't have any guests lined up as of yet (last time the main actress was supposed to come and she flaked like an hour before the movie, so I'm not going to bother again; Bill Moseley has given the show his blessing but will be out of town), if there IS any Q&A or intro it will be BEFORE the movie, so make sure you're there on time! Once again the showing is at 11:59pm on Saturday, September 14th - see you then!